The standard interface that glues Progress Business Logic and Java. ABL JDBC driver brings the power of Progress ABL to the Java world in a standardized way. 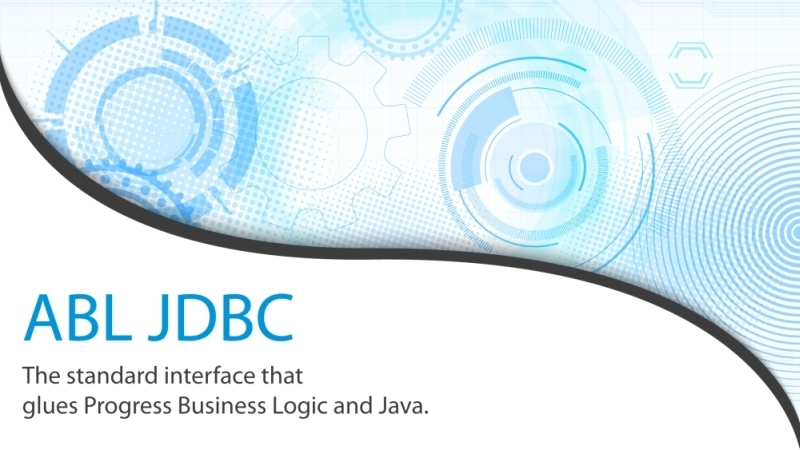 By leveraging your existing business logic the ABL JDBC driver can expose it to powerful reporting engines or data integration tools. This can help you to integrate versatile reporting solutions inside your Progress ABL application or easily respond to application and data integration requests without the pain of going to complex application changes to support them. What differentiate ABL JDBC for existing JDBC driver is that it facilitate access to the business logic instead of the low level raw data access provided by the regular JDBC through the SQL engine. The high level overview diagram shows how can ABL JDBC be the missing piece in the data puzzle. Use the same business logic that already exist in your application to prepare data for reports or export to other systems using extract transformation tools. The advantages are that the business logic is kept in a single place, no need to duplicate it in different technologies (ABL, SQL), changes in the application business logic are immediately applied even for reports (as long as the result set does not change the reports will run as before even the data retrieval logic was substantially changed), use the same security implemented in your application without having to go through all the hassle of setting SQL security. Documentation can be browsed online or it can be downloaded in a more convenient format for offline reference.The documentation include a JDBC client data access section as well as a detailed section of the business catalog back-end implementation. Licenses for ABL JDBC product can be purchased through ShareIt platform for both driver and server components. For driver component volume licenses discount applies and for convenience a bundle of one server component and ten driver licenses is available. Once the order is completed a license key file will be sent by email along with the product. For each purchase we offer a full year free upgrades along with email based support for a period of 6 (six) months. Maintenance is available for 20% of the purchase cost per year and includes full email based support and free product upgrades. Apart volume license discount we also offer the option of unrestricted access model for ISV/VAR under a technology partnership agreement, for more details contact us directly. As the project is in a stable state and it was successfully tested with a number of Java applications among the tools that were reported to work so far we can name: Pentaho Report, Birt, Jasper Report, Squirrel SQL, Pentaho ETL, Open Office.You can download the evaluation version to see it in action, we do appreciate any kind of feedback that you can provide: the tool that your did tested with, did it work, any other suggestions or comments that you might have.